Think Jamaican bobsledding or Swedish basketball, and you get an idea where Rochester John Marshall fit in the state’s hockey hierarchy when the Rockets arrived in St. Paul for the 1977 state tournament. A southern Minnesota school hadn’t qualified for the state’s showpiece event since Rochester High made four straight appearances starting with the first state tournament in 1945. For more than 30 years Rochester’s runner-up finish in 1946 was the crowning achievement for schoolboy hockey south of the Twin Cities. John Marshall’s sophomore-laden lineup didn’t figure to offer much resistance to a 1977 field that featured the likes of longtime state powerhouses Roseau, Grand Rapids, South St. Paul and Edina East. Duplicating Pee Wee- and Bantam-level victories in front of sparse crowds at community arenas is no guarantee when the stage is the cavernous St. Paul Civic Center and the attendance totals more than 17,000. 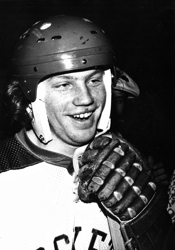 Lecy played on a prolific scoring line with his sophomore brother, Todd, and junior Bruce Aikens. The Lecys’ and Aiken’s fathers had played for the United States Hockey League’s Rochester Mustangs in the semi-pro, senior United States Hockey League. The USHL was one of the few post high school and college options for top-level players from Minnesota and throughout the U.S., and many Mustangs put down roots in Rochester after their retirement. Mostly, the Rockets got it right. They were 22-2-0 entering the state tournament, where they opened with a 4-1 triumph over Minneapolis Southwest. Lecy scored three of the Rockets’ goals as part of one of the highest-scoring seasons in state history. Lecy’s 61 goals in 1976-77 ranks as the fourth-highest total in state history. His 112 points ranks fifth. John Marshall slipped past South St. Paul 1-0 in the semifinals on a goal by Todd Lecy with 29 seconds remaining in regulation. It was one of the rare occasions that season in which Scott Lecy was held without a goal. “When (Scott) Lecy had the puck on his stick I would say, ‘Oh, no,’ ” longtime Rochester Mayo coach Lorne Grosso said. “I would watch him put the puck wherever he wanted it. John Marshall needed an extraordinary performance if it was going to get past Edina East in the state championship game. Lecy, as always, delivered. He scored twice and had two assists in the Rockets’ 4-2 triumph. His goal just more than a minute into the third period proved to be the winner. The state title for John Marshall, which also featured shot-blocking, shutdown defenseman Jeff Nelson and brilliant sophomore Paul Butters in goal, remains the only big-school championship for a team south of Burnsville. 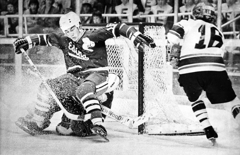 The title was stunning even for Eric Strobel, the former Rochester Mayo star who grew up skating with the Lecys and most of the rest of John Marshall’s standouts on Rochester's outdoor rinks. Strobel was on vacation – spring break during his freshman year at the University of Minnesota – when he heard the shocking news. With Lecy pumping in goal after goal, the Rockets were capable of most anything. Lecy took his scoring touch to the University of Wisconsin, where he ranks fifth all-time in scoring with 210 points. He helped lead the Badgers to the 1981 national championship. Lecy scored 56 goals in 39 games playing for the Nijmegen Devils in the Netherlands in 1981-82. 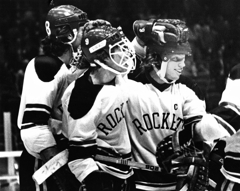 He retired from pro hockey in 1983 and returned to Rochester John Marshall as the Rockets' head coach for five seasons before stepping down last spring. He lives in Rochester and works as an agent for Elcor Realty.